Simple dish, incredible presentation! Guests and kids alike enjoy this meal, because it allows them to choose a piece of this and a piece of that to make their own unique creation. The dish includes a combination of herbs – rosemary for the lamb and dill for the dip that complements the dish and may remind you of gyro. The vegetable skewers can be grilled or baked in the oven. Enjoy my take on a Mediterranean feast with flair! Serves 4. For meatballs, combine all ingredients well using your hands. Roll into 1 inch sized balls and place onto a cookie sheet sprayed with non-stick cooking spray. Bake in a preheated oven at 375 degrees for 20 minutes. Once cooked, remove and serve on a platter or place on skewer for added presentation as shown in the above picture. Make vegetable skewers by mixing olive oil, rosemary and garlic in a large mixing bowl. Add tomatoes, red onion and mushroom and toss until evenly coated with mixture. Begin placing vegetables onto skewers using a pattern of mushroom, red onion, tomato. Repeat until all vegetables are used. Place skewers onto a cookie sheet sprayed with non-stick spray. Bake in preheated oven at 375 degrees for 20 minutes. For cucumber dip, combine all ingredients in a medium sized mixing bowl and transfer to a small decorative serving dish. 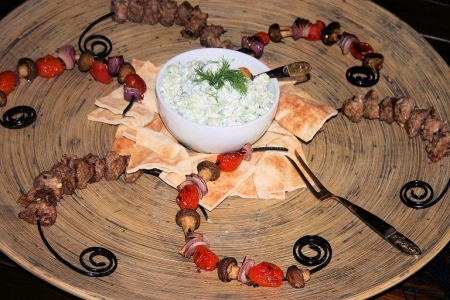 To serve, place skewers on a large serving platter as shown and serve with dip and pita bread. ﻿﻿Try ﻿Real De Aragon Garnacha by Pagos Familia Langa (Calatayud, Spain), Lo Brujo GarnaCha Calatayud (Spain), Rodney Strong Pinot Noir (California), Pedroncelli Pinot Noir (Russian River Valley, California), Saint Arnold Brown Ale (Houston, TX), Samuel Adams® Boston Lager® (Boston, MA) or Bass Pale Ale (England).